Aimersoft Video Converter Ultimate is a professional video to PSP Converter that can convert all popular video formats, including AVI, MP4, MOV, MKV, FLV, VOB, MTS, MKV, etc. to PSP supported media format. 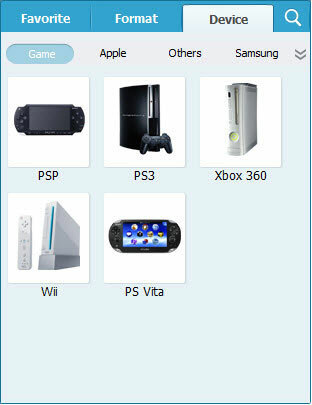 With this PSP Video Converter, you can convert any video files for your PSP easily! In addition, the upgraded PSP Video Converter allows you to convert videos to PSP supported media formats as well as other video/audio formats like WMV, AVI, SWF, FLV, MOV and more. Besides, Aimersoft Video Converter Ultimate also supports converting videos to optimized format for mobile devices like iPad (iPad mini), iPhone (iPhone 5), PSP, Nokia, LG, Microsoft Surface, Sony Ericsson and more. So you can enjoy your favorite videos on your cell phone or other video player anywhere you want! 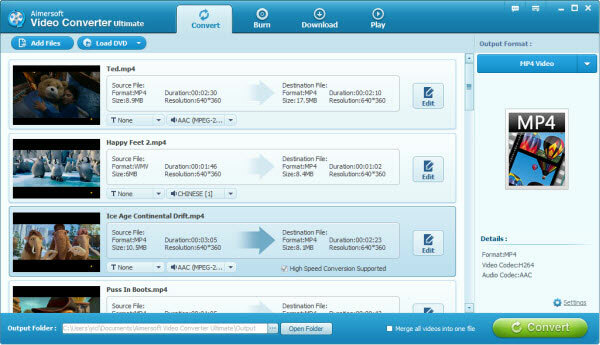 Install and run Video Converter, then convert video to PSP follow the steps. Import video files from your computer or devices (like USB, MP4 player, cell phone, etc.) by clicking Add Files button or directly dragging the video files inside. After loading successfully, you can preview the videos, take snapshots etc. Select "Devices > Game" from "Output Format" drop-down list, and then choose the video format you want to convert for your PSP. You can tick “Merge all videos into one file” on the right bottom of the interface. And click “Edit” on the right of the selected video, you can make changes to the video effects as you wish. In the editing window, you can trim your favorite part from the video, crop the frame size, adjust the visual effects, or add watermarks or subtitles. If you want to change the video parameters, go back to the main interface and click “settings” on the right bottom, you can select the video encoder, resolution, audio channel, and more. When all the settings are done, click Convert button to convert video to PSP. After finishing the converting process, you can enjoy your favorite movies, videos on your PSP.